With over 330 pharmacies, Kronans Apotek is the third largest pharmacy chain in Sweden. Kronans Apotek has approximately 27 000 items in total and around 4 million location/SKU combinations. The customers value the right product range; at the same time, it is also time consuming and challenging for the pharmacy staff to plan the correct assortment and availability, resulting in high inventory levels. The inventory management at Kronans Apotek had become too decentralized and Kronans could not properly manage varying seasonal patterns, frequent product replacements, and new pharmacy launches. The inventory levels were high and Kronans wanted to decrease them by 15% while increasing the service level by 1.5 %. At the same time, they wanted the inventory optimization to be less time requiring and centralized to give their staff more time to spend on giving service and advice to customers. 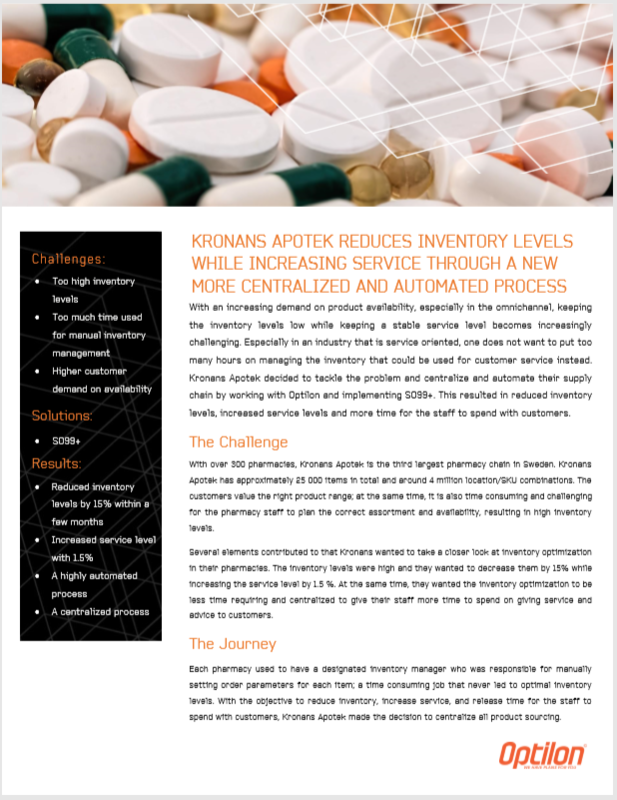 “A few months into the implementation we saw a decrease in the inventory of prescription based items by approximately 15 percent, specifically for the pharmacies where we had implemented the inventory optimization solution.” Says Tina Jalap, Supply Chain Manager at Kronans Apotek. To get your hands on the customer case, download the pdf below.